Tags: "Annie's Blue Ribbon General Store", "easter baskets", "garden bunny"
Need bunnies? We got ’em! If you have not yet assembled your Easter baskets, or need some additional cuteness, we still have a few of the adorable Jellycat Garden Bunnies! These little guys are so cute they make me want to take them home and line them up on my bed. Or pile them into a mesh hammock in the corner of my room. Somebody save me from my 8-year-old self! We’re even open Easter Sunday from 12-4pm for all of you last-minute shoppers! Tags: "Annie's Blue Ribbon General Store", "optimism buttons", "spring equinox"
It doesn’t really feel like it’s SPRUNG quite yet, but today is officially the first day of spring! The chilly temperatures here and throughout most of the country make it hard, but we’re all about OPTIMISM here at Annie’s! So in honor of the Equinox, new life, and fresh beginnings we give you our jar of optimism! 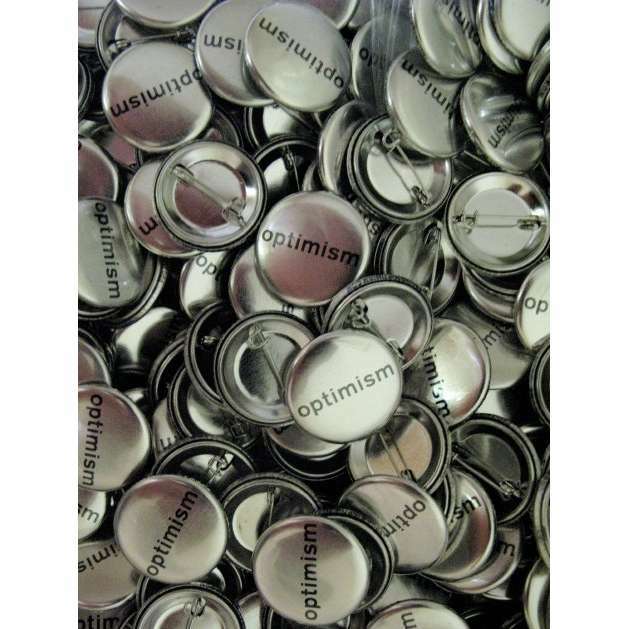 Available in store only, these buttons are sweet and to-the-point. Tags: "Annie's Blue Ribbon General Store", "spirograph"
Everybody likes math and art,right? Am I alone on this? Since its invention as a drafting tool in 1965, the Spirograph has been a way for people of all ages to create, combining the principles of art and mathematics. Our new deluxe set includes: 19 gears, 2 rings, 1 rack, 3-Ounce of Spiro-Putty, 3 retractable ball point pens, a 14 page guide book, 20 sheets of design paper and a carry along storage case with a built in work surface. It even works with most standard pens, pencils, and markers so the possibilities are endless! Tags: "50 states flash cards", "50 states flashcards", "Annie's Blue Ribbon General Store"
We close out our unofficial celebration of maps with our 50 States Flashcards! On one side, the card displays the state silhouette only; the opposite includes the state name and postal abbreviation. They’re obviously a great learning tool, but they’re also gorgeous, and totally frame-worthy! Tags: "alison hardcastle", "Annie's Blue Ribbon General Store", "word map"
This map is so cool. The boundaries of each state are drawn with words and phrases that epitomize it, along with varying typecasts to capture their character. It’s a stunning piece of art as well as a conversation piece. After 6 months of research, illustrator Alison Hardcastle spent 73 hours hand painting the 919 words that make up the US. Truly spectacular! Lithographic print on high quality recycled paper. Take the 4 Train to Cool Whip…. Tags: "Annie's Blue Ribbon General Store", "maira kalman", "rick meyerowitz", "subculinary map"
The absolutely brilliant Maira Kalman strikes again! We looove this artist’s clever books and New Yorker covers, especially her famous collaboration with Rick Meyerowitz, New Yorkistan. New Yorkistan was made into one of our favorite, and most popular puzzles. It’s been out of print for a few months now, but stay tuned! It’s coming back soon!! 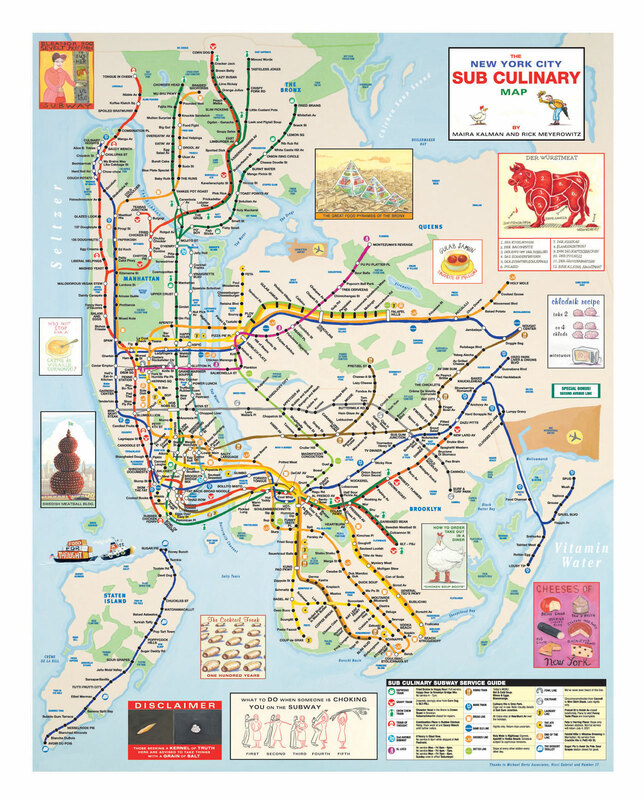 So this dynamic duo has done it again with the New York City Sub-Culinary Map. The NYC Subway Map has been recreated with food-related names, including the mysterious future Second Avenue Subway!